Sunscreens. Used to be you could just slap one on and go out feeling protected and at ease. Not so much anymore. Studies have shown that a number of chemicals in sunscreens, such as PABA, cinnamates, oxybenzone, and more can react with the sun’s rays to create damaging free radicals, which may actually increase the risk of skin cancer. Chemical sunscreens have also been linked with hormone disruption. Research has found that they can act like estrogen in the body, throwing natural hormones off balance. In a study of six common sunscreen chemicals, five acted like estrogen, causing an increase in human breast cancer cells. Another concern with these sunscreens is that they have the potential to penetrate deeply into skin, getting inside the body. A 1999 study, for instance, found that all sunscreen agents tested penetrated into the skin, with benzophenone-3 (oxybenzone) passing through in significant amounts. In 2008, the Centers for Disease Control and Prevention (CDC) reported that nearly all Americans were contaminated with oxybenzone, which has been linked with hormone disruption and allergies. To get away from these risks, most dermatologists and other skin care experts recommend using so-called “physical” sunscreens like titanium dioxide and zinc oxide. Here’s more on the subject, and why we chose zinc oxide for our formula to protect skin from cancer and premature aging. For many years now, people have been categorizing sunscreens into two groups—physical and chemical. Chemical sunscreens are made in the laboratory, and are like those listed above—cinnamates, oxybenzone, etc. They are said to reduce sun damage by absorbing UV rays and robbing them of their harmful power. Physical sunscreens, on the other hand—like zinc oxide and titanium dioxide—are made of natural elements found on the earth, and are said to “block” or “scatter” UV rays so they never penetrate the skin in the first place. Later research showed this wasn’t entirely true—physical sunscreens absorb UV rays as well—but they do retain some scattering ability, depending on the size of the UV wavelength. It all gets very scientific, but you can still think of these two groups when thinking about the different types of sunscreens available. In general, physical sunscreens are considered to be the safer options because they offer a more broad-spectrum protection, and lack the hormone-disrupting effects. Most sunscreens list an SPF number on the label. SPF stands for “sun protection factor,” and is a measurement of protection from only UVB rays, which are the ones that cause redness and sunburn. UVA rays are considered even more dangerous, as they penetrate skin more deeply and are linked to skin cancer. But SPF does not measure a sunscreen’s protection against UVA rays—only UVB rays. To further explain—the SPF is a measurement of the difference between the amount of sunlight that causes redness in sunscreen-protected skin, and the amount that causes redness in unprotected skin. A sunscreen with an SPF of 15 theoretically gives you 15 times the minutes to stay out before you burn. Example: if you usually burn in 10 minutes, and you apply an SPF 15 product, you can stay out for 150 minutes. There are some problems with this equation, though. It makes people believe that an SPF of 30 would allow them to remain twice as long in the sun as an SPF 15. In truth, an SPF 15 blocks about 93 percent of UVB rays, while an SPF 30 blocks about 97 percent, and an SPF 50 about 98 percent. So going higher and higher doesn’t necessarily create more protection after a certain point. In addition, these numbers have nothing to do with UVA rays, so people who slather on an SPF of 50 and stay in the sun for hours are likely to suffer even more severe skin damage if they don’t have a “broad spectrum” sunscreen that protects from both UVA and UVB rays. Studies just don’t support the idea that a higher SPF provides more protection. In addition, high SPF products are often made with greater percentages of chemical ingredients, which may be linked to hormone disruption, trigger allergic reactions, and potentially expose you to more free-radical damage. When formulating sun protection, the highest priorities are broad-spectrum protection and safety. Manufacturers want to offer our customers protection from both UVA and UVB rays, along with protection from free radicals, which cause premature ageing. Zinc oxide has had a long history of use as a sun protection. It offers broad-spectrum protection, shielding you from both UVB rays, which cause sunburn, and UVA rays, which penetrate more deeply and may be more dangerous in terms of causing skin cancer. Though titanium dioxide works in a similar manner in providing broad-spectrum protection, its safety isn’t as well-documented as zinc’s. Zinc is an essential mineral that we actually need in our bodies for optimal function, and is the only active sunscreen ingredient approved by the FDA for infants under six months. 1997: Researchers tested zinc oxide and found it offered broad-spectrum UV protection, and was “photostable,” meaning it didn’t alter in dangerous ways when exposed to UV rays. 2000: Researchers compare zinc oxide with titanium dioxide for their abilities to weaken UVA radiation. They found that zinc oxide provided superior protection against long-wave, damaging UVA rays. 2001: Researchers compared zinc oxide to titanium dioxide and found that zinc demonstrated “superior protection” compared to titanium dioxide against long-wave UVA radiation, and was less “white” at a given concentration in the formula. 2002: In Sunscreens by the Cosmetic Science and Technology Series, researchers report that while titanium dioxide is an excellent UVB blocker, zinc oxide offers broader protection as a UVA and UVB block. Zinc oxide, which is still considered the safest option in sunscreens. It’s the only sunscreen recommended by the FDA for babies. It offers superior broad-spectrum protection against both UVA and UVB rays, and will help protect you from skin cancer and accelerated signs of aging. Antioxidants, which neutralize free radicals. 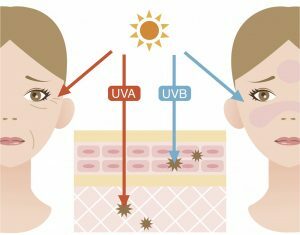 Part of the reason UV rays damage skin is that they create damaging free radicals. Antioxidants automatically neutralize free radicals, giving you double the protection. 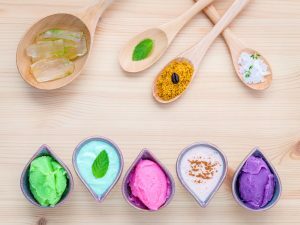 If you’re regularly applying other forms of antioxidants to your skin (in the form of essential oils or other antioxidant-rich lotions), you’ll give your skin an added boost of protection. We like antioxidant-rich rosemary, green tea, vitamin E, and buriti fruit oil. Natural sun protection: Green tea extract has been found in studies to lower risk of skin cancer. Sunflower oil is a good source of beta-carotene, and helps make skin less sensitive to the sun. Sea buckthorn berries are known to help block UV penetration, and also help encourage skin regeneration. Lavender has shown in studies to inhibit the free radical damage caused by UV rays. Natural anti-inflammatories help reduce skin’s reaction to the sun, allowing it to stay calm and comfortable. Look for ingredients like aspen bark extract, helichrysum flowers, and aloe vera. Natural moisturizers, which keep skin hydrated and healthy. The stronger and more cohesive your skin is, the better it is able to resist UV damage. Hydration is a key part of this process, as dry skin is likely to crack and flake, making skin more vulnerable to UV damage and premature ageing. This entry was tagged anti-ageing, skincare, spf. Bookmark the permalink.